China has been quietly and aggressively going after drone technology. Between drones and space warfare such as the ability to kill satellites, China is preparing heavily for confrontation with the US. They join a new axis of evil with Russia and Iran and the atomic clock is ticking. BEIJING – For almost two years, hackers based in Shanghai went after one foreign defense contractor after another, at least 20 in all. Their target, according to an American cybersecurity company that monitored the attacks, was the technology behind the United States’ clear lead in military drones. China has already deployed a drone in disputed waters off of Japan. They are now considering using them against criminals as the US is doing. They have stealth combat drones as well already up and running. So, while Obama continues to gut and weaken US armed forces; China, Russia and Iran are massively beefing up. China is not shy about hacking in and stealing our technology — using cyberespionage at every opportunity, but as the Clinton Administration gave them our technology, I suspect this one is too. Estimates say the US now has a fleet of about 7,000 drones and China’s is second to that. I don’t believe that. I believe that both Russia and China now have superior numbers to ours by substantial amounts. Certainly, it is where they spend the bulk of national funds — about 124 billion. While the Obama’s are vacationing, our enemies are girding their loins for WW III. The US would have lousy odds in Vegas right about now. Chinese drones are now showing up in other country’s arsenals – countries who hate the US specifically. They make them better and cheaper than the US does. The Chinese version of the Predator, the Wing Loong, or Pterodactyl, was first exported in 2011, according to the People’s Daily. At the Paris Air Show in June, the president of a Chinese aeronautics company told the Global Times that the drone could carry two laser-guided missiles and was the equal of the Predator in endurance and flight range, but was much cheaper. 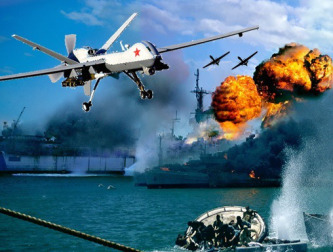 The dawn of the drone wars is here and the US has been caught flat footed and off guard once again.